No, not Hurricane Carter (for those who aren’t familiar with the song by Bob Dylan)…but the weather event. I live in the Carolinas, and this time of year is the start to hurricane season. Anyone from the Carolinas knows that hurricanes can be a non-event, or they can destroy entire homes and businesses…there is just no telling what will happen. If you live in Wilmington or one of the countless beach towns along the coast, you know all too well what a hurricane can do to your beautiful respite away from the grind. Get further inland, and it’s not as bad—but they sometimes come in as far as Raleigh, and they wreak havoc. The last one in my memory that was really wild hit Raleigh in 2016. I remember it vividly because I was watching NC State battle it out against the Notre Dame Fighting Irish in the stadium…check out the article about the “event.” There was so much water! Rain was going every direction, and flooding was rampant. We made it to half time before we left, and I admit that I was a wreck driving home. Why am I telling you this? Because countless businesses were under water after that storm. Warehouses were flooded with ruined stock and supplies, front-door businesses downtown were flooded to the point where they literally could not open their doors, due to 18 inches of water keeping the doors pinned shut to their frames. Many businesses flooded or lost power and would not recover for months. Can your business survive a hurricane or other disaster? Can you afford to be out of commission with no access to your systems for a week or more? How will your employees work in a building that smells of mildew and rain washout? What do you do to avoid a disaster following a disaster? What is your business continuity plan? Insurance may cover your costs, but can your business weather the storm? 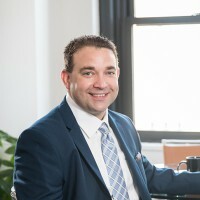 When I talk with CIOs, I always ask them, “What is your disaster recovery plan?” It’s a pretty safe question to ask, but you would be amazed at the responses I have received—everything from a back-up server in the other room to an elaborate solution involving waterproof rooms with back up generators, all the way to expensive secondary data center rentals. But more often than not, the answer is…we don’t have one. Sure, you are a wise business person. You perform backups send them off site…you have done all the due diligence to protect your data and your assets. But what happens when the hurricane comes for you? You might have backups of your data, but can your business survive an outage for 4 hours? 4 days? 4 weeks? Can you afford your disaster recovery plan? Let’s say you do have a disaster recovery plan. So, the next question is, can your business actually afford the plan you think you need? If you have the operating income to have an entire duplicate data center sitting multiple states away, and you are happy with that solution, you are really doing amazing (and note, give me a call, because I would LOVE to talk to you about other Cloud technology!). But, if you are like most businesses, that isn’t an option. It is cost prohibitive, and even if it were not cost prohibitive, it’s questionable whether you could truly duplicate your entire set of hardware and systems to another physical location on your own without a Microsoft-type partner backing up your operation. And then there’s the manpower required to test this solution continually and keep it running 24×7, 365 days a year. The Cloud as a disaster recovery solution: What about the hurricanes? It’s a bit tongue-and-cheek, but one of the best and easiest solutions for the Cloud is actually disaster recovery. Microsoft has pioneered the concept of the Hybrid data center, extending your on-premise systems into the Azure Cloud. By doing so, you have the capability to have real time, up to the minute, system replication into Azure. As your business is operating daily, you can feel confident that there is an entire sleeping system in Azure that is up to date with every credit card transaction, every order, and every quote that you have been working on during the course of business. With Azure, you only pay for what you use…so having a full replica of your data center in Azure will amount to paying for the storage your solution consumes, and the rest is “shut off.” If you were to develop an entire secondary data center, you would be renting (or owning) servers that you will (hopefully) never use, and they would sit idle! Let’s look at this from another point of view. The hurricane hits. Your floor floods. Your servers are under water—and all of this is happening while you are watching the Irish get handled by the NC State Wolverines. But, you aren’t freaking out (right now, anyway) because everything is sitting in the Azure Cloud, ready to come online and continue business. 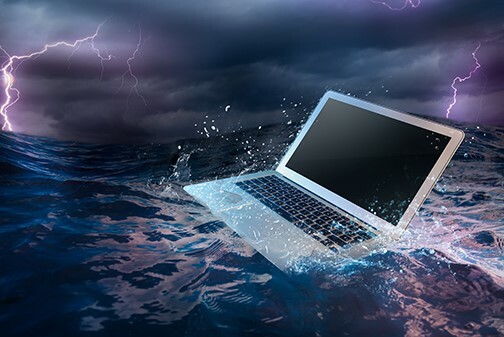 Sure, your office is under water, and you lost your servers, but you are still in business and up and running in minutes. That’s the key. And if you can’t afford any downtime at all, you could have a full High Availability solution in Azure that is already online—no outage at all! You could be the hero of this story, singing your own hurricane song. A viable, affordable disaster recovery plan is in the Cloud. Download our High Availability & Disaster Recovery Service Offering, then contact the Azure experts at AKA Enterprise Solutions to discuss the best plan for your organization.